The literary aspirations and inspirations of the films of Wes Anderson have always played a large part of his oeuvre. While on a lesser scale in his debut Bottle Rocket, they were at the forefront of both Rushmore and his masterpiece The Royal Tenenbaums, which were co-written by Owen Wilson. 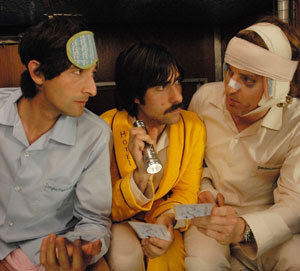 Anderson made a misstep with his Tenenbaums follow-up The Life Aquatic with Steve Zissou, co-written not with Wilson but The Squid and the Whale auteur Noah Baumbach and that’s when film lovers began to turn on the overly hip and stylized films—colorful movies with art direction that was likened to dollhouses, bright theatrical sets and characters with obvious costumes all placed in the center of the frame a la Roman Polanski. Suddenly, Anderson became a precocious and overeager student, kind of like Rushmore’s Max Fischer (played by Jason Schwartzman)-- the annoying but undeniably talented youngster who is obviously a little too impressed with himself and his purported importance. While I never completely bailed on the Anderson bandwagon, I was very disappointed by Life Aquatic but just attributed it to be an example of artistic excess and freedom run amok. Anderson re-teamed with Rushmore star Jason Schwartzman who, along with Roman Coppola (Francis Ford Coppola’s son and Schwartzman's cousin) banded together to write his newest film, The Darjeeling Limited which is much more successful than its predecessor. However, ultimately it’s still hard to separate "Anderson the reputation" from "Anderson the filmmaker" given the shots that call attention to themselves and an unbelievable storybook sensibility with an overabundance of metaphors laid on extremely thick throughout the otherwise affable film that make Darjeeling feel like an ideal candidate to be analyzed in Introduction to Film classrooms or high school honor's English. In addition, the film is a fascinating work of Hollywood family analysis as it’s nearly impossible not to wonder about the Coppola involvement and metaphors to their own family along with the Wilson brothers as Owen Wilson is the film’s main star and when he appears onscreen covered with bandages, the audience does gasp in sad recollection of his recent tragic suicide attempt. With a prologue entitled Hotel Chevalier that can be seen for free on iTunes and on the web (that, despite being separated from the ninety minute feature will no doubt appear on the DVD), the ambitious and sprawling Darjeeling tells the story of three brothers who haven’t spoken to one another in a year since the funeral of their father. When the film opens, long-legged and skinny Peter, played by Adrien Brody (looking appropriately nerdy) races to board the Darjeeling train in India where he reunites with bossy itinerary minded eldest brother Francis (Owen Wilson) battered from a near-death experience and his youngest brother Jack (Jason Schwartzman), sad-eyed from a recent tryst in his troubled relationship that’s far past its expiration date. Peter comes with his own baggage literally and figuratively as he has escaped his pregnant wife in what seems to be a personal responsibility crisis and with his many designer bags that had belonged to his deceased father (all eleven pieces of luggage were designed by Marc Jacobs for Louis Vuitton). During the trip through India, the three agree with much prodding from Francis to undergo a spiritual journey and become closer in their relationship but ultimately result in gossiping amongst each other with prefaces not to tell the absent brother whatever information is being transpired, only for the confidant to break that promise moments later and betray the information. Abusing Indian pharmaceuticals while trying to fake their way through praying at shrines, the story is best when dealing with the interplay between the brothers in an understated manor and at its worst when forcing the many metaphors (baggage that should be abandoned, prescription glasses that make Peter see the world through his dad’s eyes, Francis’s bandages indicating his need for healing and Jack’s sublimation through art) down our throats or trying overly hard to fit in with Anderson’s other films in its obligatory inclusion of a well-timed slow-motion shot, Rolling Stones songs and other painstakingly choreographed moments. All in all, a return for Anderson back to the right direction of his career (heading closer to Tenenbaums and Rushmore territory than Life Aquatic) but like the brothers in Darjeeling, we do get the feeling that an entirely different journey would be beneficial for his filmmaking and while the Coppola family make excellent screenwriting partners, we do long for another collaboration with the gifted Wilson.